The International Teletraffic Congress (ITC) is a recognized international organization taking part in the work of the International Telecommunications Union. The congress traditionally deals with the development of teletraffic theory and its applications to the design, planning and operation of telecommunication systems, networks and services. The contents of ITC 14 illustrate the important role of teletraffic in the current period of rapid evolution of telecommunication networks. A large number of papers address the teletraffic issues behind developments in broadband communications and ATM technology. The extension of possiblities for user mobility and personal communications together with the generalization of common channnel signalling and the provision of new intelligent network services are further extremely significant developments whose teletraffic implications are explored in a number of contributions. 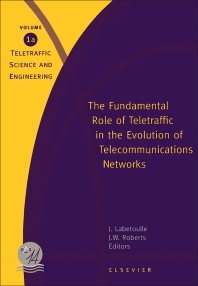 ITC 14 also addresses traditional teletraffic subjects, proposing enhancements to traffic engineering practices for existing circuit and packet switched telecommunications networks and making valuable original contributions to the fundamental mathematical tools on which teletraffic theory is based. The contents of these Proceedings accurately reflect the extremely wide scope of the ITC, extending from basic mathematical theory to day-to-day traffic engineering practices, and constitute the state of the art in 1994 of one of the fundamental telecommunications sciences. Preface. VOLUME A. Directions in Teletraffic Research. ATM Multiplexer Performance (1). Signalling and Intelligent Network Performance. Analysis of Queueing Systems (1). B-ISDN Traffic Descriptors. Switch Overload Controls. Video and Data Traffic Characteristics. Performance of New Network Services. B-ISDN Traffic and Resource Allocation. ATM Multiplexer Performance (2). Teletraffic Analysis of Mobile Telecommunications. Performance of Networks of Queues. Worst Case ATM Traffic. ATM Switch Design. Dynamic Routing. Analysis of Queueing Systems (2). Simulation Techniques. VOLUME B. Performance of Data Networks. Advances in Teletraffic Modelling. B-ISDN Network Management and Design. Performance of Local and Metropolitan Area Networks. Analysis of Queueing Systems (3). Adaptive Connection Admission Control in B-ISDN. B-ISDN Network Architecture. Traffic Management and Network Dimensioning. Multirate Traffic Performance. Congestion Control in B-ISDN. Design of Circuit Switched Networks. B-ISDN Design Issues. Peak Rate Policing in B-ISDN. Robust Transmission Network Design. Data Network Protocols and Routing. Author Index.